Explore and discuss works in the Spacemakers and roomshakers: installations from the collection , and take part in an artist-led artmaking session inspired by the exhibition. 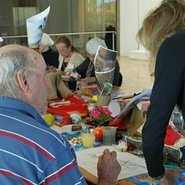 Part of our regular program of art and dementia events held throughout the year on the third Thursday of the month, with a different focus each month. Note: this program was originally scheduled on 16 August. The Gallery apologises for any inconvenience.